Travis Witherspoon does not have any MLB stats for the season. Draft: 2009, Los Angeles Angels, 12th rd. November 6, 2015 CF Travis Witherspoon elected free agency. September 12, 2015 Rancho Cucamonga Quakes activated CF Travis Witherspoon from the 7-day disabled list. August 30, 2015 Rancho Cucamonga Quakes placed CF Travis Witherspoon on the 7-day disabled list. August 28, 2015 Rancho Cucamonga Quakes activated CF Travis Witherspoon from the 7-day disabled list. July 23, 2015 Rancho Cucamonga Quakes placed CF Travis Witherspoon on the 7-day disabled list. June 21, 2015 Rancho Cucamonga Quakes activated CF Travis Witherspoon from the 7-day disabled list. June 11, 2015 Rancho Cucamonga Quakes placed CF Travis Witherspoon on the 7-day disabled list. June 7, 2015 CF Travis Witherspoon assigned to Rancho Cucamonga Quakes from Ogden Raptors. 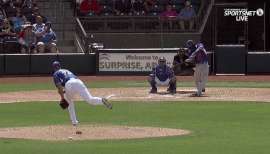 June 6, 2015 CF Travis Witherspoon assigned to Ogden Raptors from Rancho Cucamonga Quakes. May 27, 2015 CF Travis Witherspoon assigned to Rancho Cucamonga Quakes from Tulsa Drillers. March 2, 2015 CF Travis Witherspoon assigned to Tulsa Drillers. February 21, 2015 Los Angeles Dodgers signed free agent CF Travis Witherspoon to a minor league contract. November 2, 2014 Bakersfield Blaze released CF Travis Witherspoon. May 15, 2014 Travis Witherspoon roster status changed by High Desert Mavericks. April 28, 2014 High Desert Mavericks placed CF Travis Witherspoon on the 7-day disabled list retroactive to April 23, 2014. April 1, 2014 CF Travis Witherspoon assigned to High Desert Mavericks from Jackson Generals. December 18, 2013 Seattle Mariners sent CF Travis Witherspoon outright to Jackson Generals. December 13, 2013 Seattle Mariners designated Travis Witherspoon for assignment. October 8, 2013 Seattle Mariners claimed CF Travis Witherspoon off waivers from Los Angeles Angels. September 30, 2013 Los Angeles Angels recalled Travis Witherspoon from Arkansas Travelers. March 11, 2013 Los Angeles Angels optioned Travis Witherspoon to Arkansas Travelers. November 20, 2012 Los Angeles Angels selected the contract of Travis Witherspoon from Arkansas Travelers. July 20, 2012 Travis Witherspoon roster status changed by Arkansas Travelers. June 20, 2012 CF Travis Witherspoon assigned to Arkansas Travelers from Inland Empire 66ers. March 11, 2012 CF Travis Witherspoon assigned to Los Angeles Angels. August 20, 2011 Travis Witherspoon assigned to Inland Empire 66ers from Cedar Rapids Kernels. July 15, 2011 Travis Witherspoon roster status changed by Cedar Rapids Kernels. June 27, 2011 Cedar Rapids Kernels placed CF Travis Witherspoon on the 7-day disabled list. April 4, 2011 CF Travis Witherspoon assigned to Cedar Rapids Kernels from Orem Owlz. January 28, 2011 Los Angeles Angels invited non-roster CF Travis Witherspoon to spring training. July 4, 2009 Travis Witherspoon assigned to Orem Owlz from AZL Angels. June 23, 2009 AZL Angels signed Travis Witherspoon. June 15, 2009 Los Angeles Angels signed CF Travis Witherspoon.